There are some awesome foundation changes coming to WordPress 4.4 when it rolls out in December 2015. While developers are excited, end users won’t get to play with, or even see, most of these enhancements until at least early 2016. Get the scoop on what’s coming and plan for your future site. I’ll give you the skinny on each new feature, and then the non-geek version of what that means. 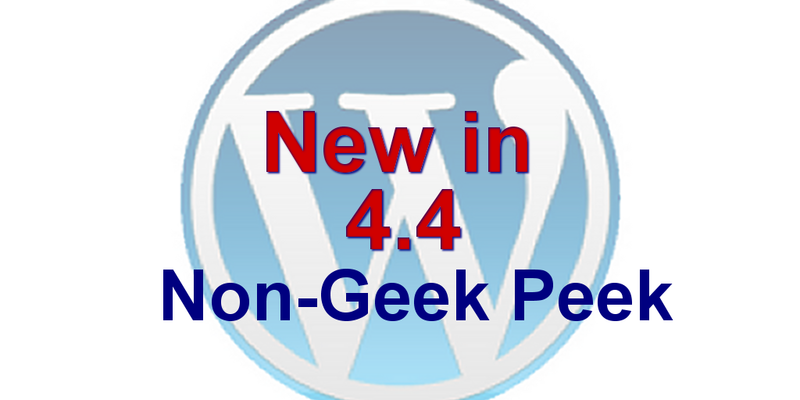 This is the big news in WordPress 4.4. The first half of it will be rolling into the core, which includes the infrastructure. The second half will be coming in the next major update in the spring of 2016, which includes the end points. They are only available now as a feature plugin. One of the big changes mentioned in the article that I hope we see with this is a reduction of the misuse of the admin-ajax API. In site audits I see a lot of plugins that do that. Hopefully devs will be motivated to revamp their code, but I bet that won’t be until the end points are put into the core too. Your site will eventually get a bit of enhancement to both speed and security. But I don’t think we’ll see a rash of plugin updates all at once. They’ll roll out as feature improvements to plugins over time. I believe the bulk of those will be after the end point inclusion in the core in spring of 2016. In other words, the REST API will revolutionize WordPress sites. But we may not see a lot of that until summer of 2016. This is only a suggested addition for version 4.4, but the devs of it are pushing hard for inclusion. PHP is the language WordPress is built on and everything has to be done in a serial fashion. That slows things down. Parallel requests will speed things up. Requests from your own database, plus requests from the outside can be processed simultaneously. Ads and resource hog plugins that pull from the outside world, like displaying your Twitter stream, won’t load your site as much. Now, that still doesn’t mean you can go bonkers adding these things. It means that if you have to have them, and you have the ROI stats to prove that they are beneficial to your business, then you won’t pay as high a penalty for them. This is also another feature suggestion, and again, the devs that created it are pushing hard for includsion in 4.4. There is already a feature plugin for it that has been working pretty well for some time now. As it stands, WordPress auto generates at least three additional versions of the original image based on the media sizes set in the standard settings or by your theme. But for mobile, it still squishes down the original. In other words, it changes the display size, but not the file size. And that means longer page load speed, especially on mobile. The new Automatic Responsive Image feature gets rid of the long load time by adding a new srcset tag that will deliver an image size that is closer to the screen size of the device on which the site is being viewed. Page load time will be faster on mobile. But, that’s only if the browser or app supports the new tag. WordPress is changing how each page and post title is handled. Devs of plugins and themes that deal with titles are encouraged to stop using the old way and move to the new way. If I’m understanding what the WordPress devs are saying about this, it will impact both the design of the theme in the way it calls titles, as well as any plugins that display titles anywhere. If that’s true, we should a expect a slew of theme and plugin updates to roll out. You’ll likely see the changes with the plugins, or actually, what you’ll see is no change in that they simply swap over to using the code in the WordPress core. That should lighten the load of the plugin. But for themes, if you’re using a framework like Genesis, it may update, but your theme won’t take advantage of it until you have your theme updated too. It’s not going to make a lot of difference either way, as far as theme is concerned, as far as I can tell. So, don’t worry about it unless you hear otherwise from me, and I don’t think you will. Designers and developers, please feel free to comment on this if you know something I’m not catching about it. There will also be enhancements to the way taxonomy terms will be handled. That process started in the WordPress 4.3 release and was the prime reason so many plugins had to be updated or risk breaking. The new taxonomy work will focus on the way things are handled in the database. But it’s unclear what impact this will have on custom post types and plugins yet. Wait and see. Nothing to be concerned about yet. The final new feature we are expecting is an addition to the oEmbed list. Now you can embed another WordPress post. So, that makes WordPress a provider instead of just a recipient of oEmbed. Maybe embed a custom post type from another site? Anybody got a vision on how this will be used? Please leave us a comment and let us know. FYI, it comes up in an iFrame. When I viewed the original article from WordPress, it said “tap to view” in the middle of an empty box. OEmbed is supposed to make it simple for you to just drop a link into your post to embed all manner of things, like tweets and other content from other platforms. But, for audio and video, you’d do much better to have a dedicated HTML5 player, otherwise you’re relying in the player that’s native to the viewer’s browser. And that may open in a new window or tab. Even YouTube recommends that you use their iFrame code if you’re embedding on your site. I’ll continue to keep you posted on developments with WordPress 4.4. Tips Tuesday podcast and post is the best way to stay informed with all site success tips that help keep you up to date and even ahead of the curve. You can also subscribe to all blog posts when you subscribe to BlogAid News.